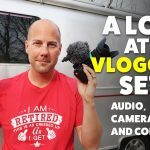 On this Airstream Life vLog, we apologize for not filming more over Thanksgiving. Courtney’s brother proposed to his girlfriend on Thanksgiving Day which made for a fun day of celebrating with family and we didn’t even think to get the cameras out. O well. We pack up our spot at the Cave Creek Regional Park, which we loved, and head down to Tucson (our old stomping grounds). We set up camp in the parking lot of Casino Del Sol with lots of other RVs. They have no time limits set up for camping so we plan to be there for a while. Plus we get loads of sun with our tilted solar panels! We also film our latest malfunctioning thing, the microwave. Unfortunately, we could not get the right size to replace it. We will have to see what we can find in the coming weeks.